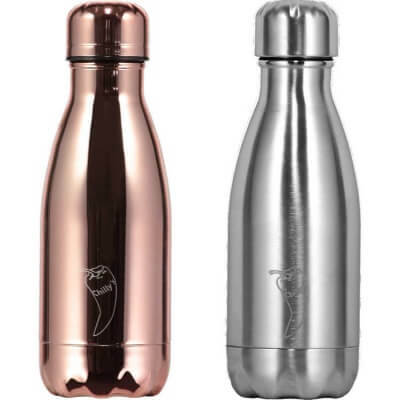 These gorgeous 260ml water bottles are just 20.3cm tall and 6.4cm diameter making them the perfect size for popping in your handbag or attaching to a bag using the handy Caribina (sold separately). They are a great size for children, perfect for lunch boxes, and ideal if you would rather refill regularly than carry around a heavy bottle all day. The metallic rose gold and stainless steel options are both practical and stylish. They are made from high-grade stainless steel, have a leak-proof lid, and will keep drinks hot for up to 12 hours and cold for up to 24.